This is our custom-built BNC to BNC 50ohm coaxial cable. Construction is BNCs with Lcom RG-58C style cable. This wire is very high quality wire, selected for its durability. This cable is fairly flexible, durable, light-weight cable, with 20awg stranded center conductor and a 95% braided shield. 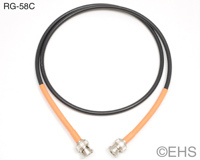 This RG-58C wire supports 1GHz or 1000MHz bandwidth. *** This is a 50 ohm cable not for use with SDI, clock, S/Pdif, or most video. Typical applications include antennas, wireless mic antennas, wireless monitor antennas and more.